The meaning of the word eutony is well-balanced tension. Gerda Alexander, developer of this somatic practice, said that it is a Western way of experiencing unity of the whole person. She also said this unity frees your creative forces and develops your ability to make contact with others while maintaining your individuality. "The way in which you realize yourself is unique. If you do not undertake the quest of finding your own way, you run the risk of losing yourself." This form of somatic education is not only about movement awareness but also about developing depth in yourself and growing toward being a total person. Here's an interview with Gerda Alexander from the January/February 1986 issue of Yoga Journal. "Interview with Gerda Alexander" by David Bersin in Bone, Breath, and Gesture: Practices of Embodiment, edited by Don Hanlon Johnson. Discovering the Body's Wisdom by Mirka Knaster has a chapter on this somatic practice. 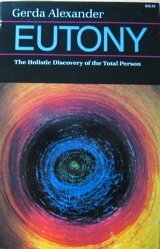 Eutony: The Holistic Discovery of the Total Person by Gerda Alexander. Planet Medicine: Modalities by Richard Grossinger has a chapter on this practice.